We're friends of Geert Wilders asking for your help. For over 10 years now, Geert Wilders, ardent champion of freedom of speech, has lived with round the clock security. 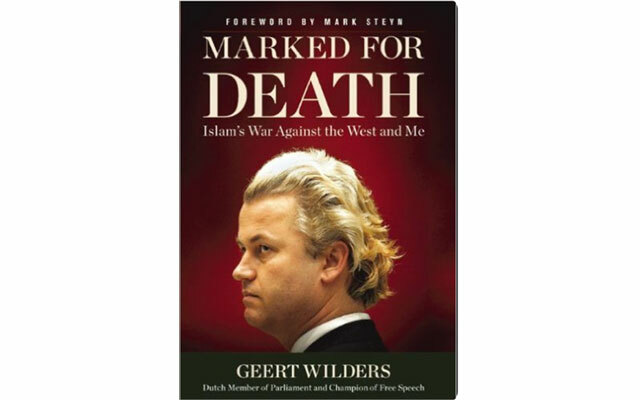 Geert has been, as his book puts it, marked for death for speaking out - for telling the truth about Islam and the content of the Quran. Yet the Quran, which includes incitement to violence against non Islamics, has not been banned though incitement to violence is against the law. No imams have had charges laid against them for upholding a book that calls for the destruction of the West, of Western human rights and liberties, including religious freedom and freedom of speech. Now Geert is facing a new danger. Once again, it is for telling the truth. Do people want more or fewer Moroccans, Geert asked. Fewer, was the resounding answer. The government, instead of listening to this simple truth, and to the many valid and even urgent reasons for it, is pressing criminal charges. According to Dutch law, the sentence for the charges brought against Geert may even include jail time. At any rate, he will carry a criminal record. Note: you will go to a page with the option to donate in 5 currencies. On the donation page, you will be able to choose the amount. This is happening just as the political situation is changing throughout the West. Ever more people are realizing the truth of what people like Geert have been saying for over 15 years about the threat of Islam. In the Netherlands, Geert and his party are rising in the polls. So are anti-Islamization parties throughout Europe - in Austria, France, England, Norway. And Great Britain has just voted to LEAVE the EU in a historic referendum - with strident resistance from those who want Great Britain to remain. Change will not be accepted easily. Geert is calling for a referendum in the Netherlands. Some believe he will be the next prime minister - which is quite likely, given his massive lead over the opposition parties. He is more popular than the next 2 leaders combined! But at the same time, throughout Europe, charges are being laid against the leaders of the anti-Islamization movements. Against Marine Le Pen in France. Against Tommy Robinson in England. And this fall, Geert may well be found guilty. So we're friends of Geert Wilders, asking for help - financial help to give him a better chance of winning his legal battle and staying alive. These are tough times for the heroes doing their best to save the West, to safeguard freedom of speech and also everyday safety. As friends, we do what we can. But we need more support. In Benghazi, 2 Navy SEALS held off hundreds of Islamics from storming the embassy for over 7 hours. In the end, they could do no more. They needed help - which was not sent, though there was help just over one hour away. We're not asking for an army. The drive for money is for the legal fund for upcoming costs. If found guilty, Geert will file an appeal. The appeal process can go on for years, terminating in some EU process (perhaps a so-called human rights court). Lawfare - a very common jihad strategy, used because it has been very effective at draining energy, time and financial resources. The long term goal is to turn the tide, to make anyone who files charges know they may themselves have charges filed, and to make the law uphold the truth and human rights - as Western law was intended to do. Again, for that, funds are needed. What is happening throughout Europe that truth-tellers are facing trumped up charges? We've all learned to be horrified at the Gulag Archipelago of Stalinist USSR, at the tanks in Beijing's Tiananmen Square bringing death to the pro-democracy movement. Political repression - the knee jerk response: it's wrong! But we're living with our own "gulag" system growing in country after country in the West, taking over parts of what is called the justice system. I think of the Crusaders, rallying against Islamic invasion. And of the Sikhs, emerging in response to Islamic horrors against Hindus. We are the Crusaders of today, the Sikhs of all religious and non-religious denominations. How do we battle? One way is to meet those against freedom of speech and human rights on "their" turf - meaning, the lawfare turf where they are fighting, because they have learned how to use our laws against us. If it were a just situation, there would be no charges against Geert. It isn't a just situation. In Lord of the Rings, in many ways, Frodo had it easy. Mordor was self-evidently evil. Smeagle was likewise visibly repulsive. No one was telling Frodo and his friends to love and accept Mordor. Now, it's as if Frodo were faced with his village transformed, much of it still looking almost as it did - but no longer safe. Mordor is everywhere, not just far away. But the villagers are prohibited from recognizing this, from speaking out about this. Frodo sees and speaks - and is vilified for being against Mordor. This is the world of Geert Wilders, vilified and marked for death for telling the truth. We're friends of Geert Wilders, and we ask you, please give generously.